The DN is the most popular iceboat in the world because it is easy to transport, rig, and relatively inexpensive. Carrying 60 square feet of sail, it offers spirited performance and a lot of very competitive sailing. The DN class is truly international with active fleets in North America, Europe, and Russia. DN sailors are on a mission to help new sailors experience the fastest sailing on the planet. Contact a club in your area or contact the IDNIYRA and we will try to put you in touch with someone who will be willing to let you take a boat out for a ride. If you are lucky enough to live in an area where iceboating is popular, join a club. 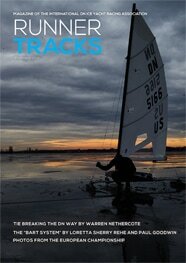 It’s the best way to learn iceboating. Club racing (or sailing with friends if there isn’t a club in your area) is safer than solo cruising which we don’t recommend even for the most experienced iceboaters. Building your own DN is a satisfying home project. Click here to go the Specifications page where you can download 11″ x 17″ official plans or order a set of plans from the IDNIYRA. DN North American members are always happy to share their technical knowledge on the DN Forum. Check out the first historic website of the DN class for informative articles on DN building. By joining the IDNIYRA for a mere $25, you help the DN class to continue to thrive and promote the sport of ice yachting. As a member, you will be part of a great, friendly and vibrant class.